Culinary Chrysalis | A teen's journey from picky eating kid to culinary professional. A teen's journey from picky eating kid to culinary professional. Hello, my lovely readers! Its been a long time since my last post but as promised, here’s Food History 3! Today I’m gonna tell you a little bit about the history of waffles! I got this information together for a research project I had to do for culinary class. I found out a lot of cool stuff about some of my favorite foods that I never knew before! (Check out my last blog to find out more about the project and the history of apple pie!) Most of this information is from this lovely website called the Food Timeline! The original waffles date back to the 12th century! Most people think that waffles are from Belgium but the first waffles were actually Greek! The Greek made flat cakes cooked between 2 irons called obleios. The obleios became the waffles we know today in the 13th century when a craftsman forged the irons into a honey comb pattern. Around that time, the French also started making waffles. The French waffles were very light pastries cooked in buttered waffle irons. They formed many patterns into the waffles. Even things like religious symbols and family crests. They were served very hot on religious feast days. Midevil cook books suggest that these waffles were a savory pastry often made with cheese. Belgians had been known for their waffles since 1818 but Belgian waffles as we know them today were introduced in 1958 at the New York Worlds fair. They were thicker and fluffier than normal waffles and were topped with whipped cream and strawberries. In 1789 Thomas Jefferson returned to the U.S. from his position as Minister to France. Along with a long-handled waffle iron that encloses the batter and gives the waffle crispness and shape. This started the trend of waffle parties, where guests can enjoy their waffles sweet (with maple syrup or molasses) or savory (topped with kidney stew). In 1911 the electric waffle maker was invented and pretty soon it became a common household appliance. In 1953, Brothers Tony, Sam and Frank Dorsa introduce frozen toaster waffles to supermarkets throughout the United States. They were originally called “Froffles,” but people started referring to them as “Eggos” because of their “eggy” taste. The company was purchased Kellogg in the 1970s and the name was changed to “Eggo”. Today, maple syrup is still the traditional waffle topping but people are branching out and making delicious things like chicken and waffles! Food History 2: Apple Pie! Hello, my lovely readers! Today I’m gonna tell you a little bit about the history of the apple pie! I got this information together for a research project I had to do for culinary class. I found out a lot of cool stuff about some of my favorite foods that I never knew before! 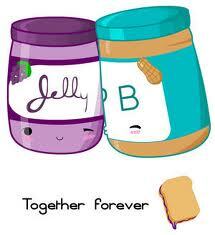 (Check out my last blog to find out more about the project and the history of PB&J!) Most of this information is from this lovely website called the Food Timeline! Apple pie is said to be as American as it gets but by the time apples even grew in America many other countries had their own version of apple pie. The first recorded recipe for apple pie was actually written in 1381 in England! It called for figs, raisins, pears, and saffron in addition to apples. Original apple pie recipes were a lot different from what we know today. They rarely called for sugar because it was expensive and hard to get. Originally, this apple pie was served in a pastry called a “coffin” which wasn’t normally meant for consumption and was only supposed to be a container for the filling. The Romans are thought to have introduced apples to England, and from there American colonists started spreading them throughout the New World and apple seeds were spread along trade routes. The colonists also brought recipes for apple pie to America. 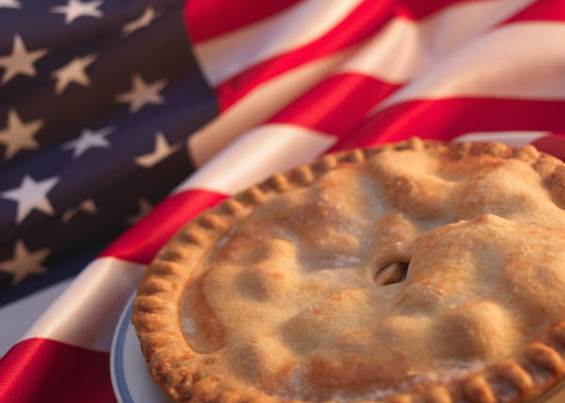 In 1902, a newspaper article claimed that “No pie-eating people can be permanently vanquished.” American soldiers during World War II also did their part to popularize the stereotype. When asked by journalists why they were going to war, a common response was, “For mom and apple pie” which later became the phrase “As American as motherhood and apple pie”. Apple pie was then quickly adopted as “the” American thing by the 1960s and the phrase “As American as apple pie” was born. America quickly became one of the largest producers of apples and today over 220,000,000 bushels of apples are produced every year in America. It is second only to China, which produces about half of the world’s apples! What if people started saying “as Chinese as apple pie”? Apple pie is one of my favorite pies! I think its really cool that a pie that started out in 1381 is still very popular today! Stay tuned for Food History 3: Waffles! I’m back!!! I’m sorry I was gone so long! It feels like forever since my last blog, I just got so busy with summer but school is back in and so am I! Now lets get right to the subject, shall we? This year in culinary class we are studying American cuisine. Our first project of the year was to pick 3 American foods and investigate them. We had to find out the history of where they came from, how they were made, and anything else we could find. At first it sounded pretty boring but once I started researching, I felt like a food detective! Super supper secret agent chef Mackenzie! Investigating the mysterious lives of American foods. The foods I chose were peanut butter and jelly sandwiches, apple pie, and waffles. It was pretty interesting so I thought I would share my findings with you. Most of my information came from this lovely website called The Food Timeline. If you’re wondering about the history of any of your favorite foods, just look them up on there and they have tons of info! The first known reference to the peanut butter and Jelly sandwich was published in 1901. It became popular immediately especially with young people in America. 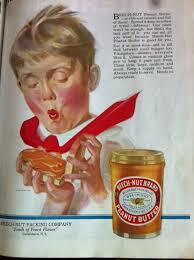 Back then, peanut butter was considered a health food or a delicacy but as the price of peanut butter went down due to commercialization and manufacturers started adding sugar to the peanut butter, it started to appeal more to children. When bread started being sold pre-sliced, peanut butter sandwiches became very popular for kids because they could make them by themselves without using any heat or sharp knives. Peanut butter sandwiches were one of the top meals for children during the depression due to its low cost, high nutrition, and easy assembling. In the 1920s people started getting really creative with peanut butter sandwiches. They paired peanut butter with everything and ended up with things peanut butter and cabbage and peanut butter pimento sandwiches. Jelly was another staple food around that time so it was only a matter of time before the perfect pair was born, the peanut butter and jelly sandwich! People in other countries think its weird but peanut butter and jelly is really one of America’s favorite flavor combos. I grew up eating peanut butter and jelly sandwiches and my little brothers love them too. Its one of those flavors that bring back lots of lovely memories and I think its the same for a lot of Americans today! Stay tuned for Food History 2: Apple Pie! I’m so excited! I’m finally starting my business! Last week I made two cakes for people who are actually paying for them! 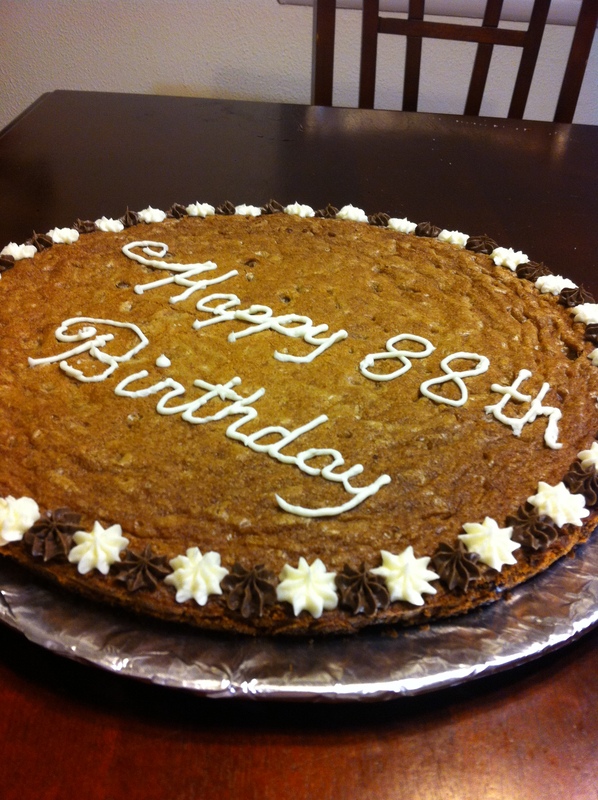 The first order was a cookie cake for a man turning 88 years old! His daughter lives in Florida so she asked me to make a cookie cake for him from her since she is unable to be there for his birthday. I mean don’t get me wrong, this is not my first time selling a cake that I made but this is the first cake order for Kenzie Kakes! I feel like my business is officially official now! Just think, this order is the first of many many cakes I will make in my life. This is the start of Kenzie Kakes! The next order was a big first too. It was a doberge cake. I’ve always wanted to make a doberge cake but I never got the time or the money so I was so excited that I got an order for one. It was for our neighbor’s granddaughter named Maddie who was turning 10. She wanted a caramel chocolate doberge cake so that’s what I made! She didn’t want any thing girly so I made it as mature as possible while still keeping a whimsical feel to it. When I made the caramel sauce it looked and tasted perfect so I used it for the butter cream but then when it cooled it got sooo grainy that I just had to throw it away and start over. The next try turned out a lot better. Thankfully, the custard only took one try and it turned out wonderfully. I put the cake together (without the ganache) and let it chill overnight Friday night. The next morning I made the ganache and put it on the cake. I was supposed to let the ganache chill a little before I decorated but I got impatient so I decorated with butter cream stars and chocolate chips. It looked beautiful but two of the decorations slid down the side of the cake by the time I got it delivered… It still looked pretty though and Maddie loved it! Everyone loved it, even me. (I got to go to the party) It was probably the best tasting cake I have ever made and I am so proud. I know what you’re probably thinking now, “But Mackenzie, This weekend was Easter! Weren’t you going to make Easter candy like you said in your last blog? ?” Yes, my dear reader, I was. But I just had to accept that sometimes real cake orders are more important than my own side projects. Besides, I can always make candy bars any time I want but its not every day that someone orders a doberge cake. I’ve been dying for an excuse to make for a long time and now I’m gonna get paid for it! Win Win! Helloo lovely people! It’s Spring time now and you know what that means? Easter! I love Easter. Everyone gets together to celebrate Jesus’s resurrection and there’s candy and egg hunts and decorating eggs and more candy! I’ve been trying to think of something to make for Easter. Something that I can give out to everyone and spread Easter cheer. I was thinking about cake pops but it seems like everyone is doing that. Then I thought, what if I made my own Easter candy? We have been making chocolate bars in culinary class recently so I’m gonna make my own and give them out for Easter. I’m ordering some egg, bunny, and chocolate bar shaped candy molds. It’s gonna be so much fun! I’m still working on the flavor ideas and stuff but I’m already excited. Ideas are welcomed! Watch out for Easter Excitement 2 where I’ll post pictures and tell you guys how the candies turned out! Cake pops and I have a complicated love/hate relationship. 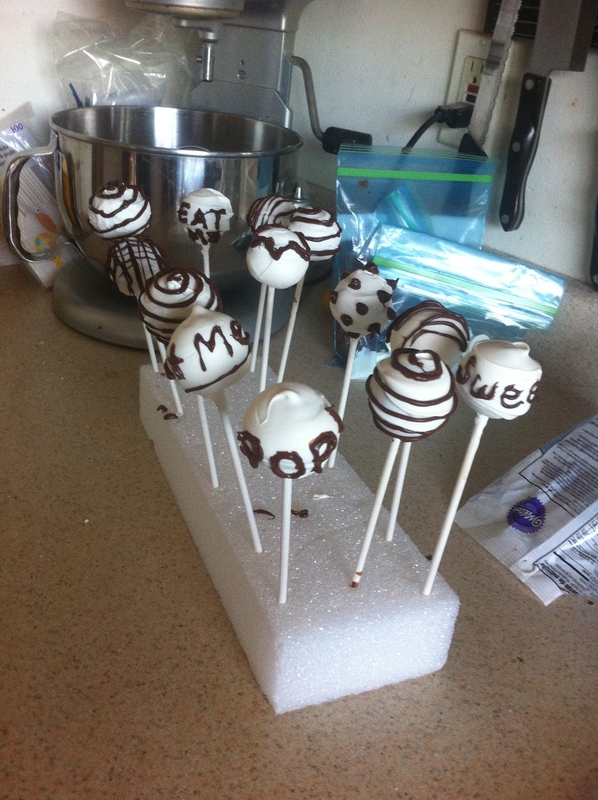 I absolutely love the idea of cake pops and I love making cake pops. Whenever I have a lot of cake scraps, I make cake pops with them and everybody loves them! … Except for me. You see, a few summers ago, my sister and I spent a lot of time making cakes and cake pops with my grandma. I had a lot of fun and those were some of my first great cakes that inspired me to start baking on my own. But I ate so many cake pops that summer and I got so sick of them that it still to this day makes me feel sick to eat them. I guess that could be a good thing though. Everyone else loves them so I can make however many I want and sell them but not be tempted to eat them! Brilliant! Making cake pops is a great way to get rid of left over cake scraps and they make great party favors and valentines. 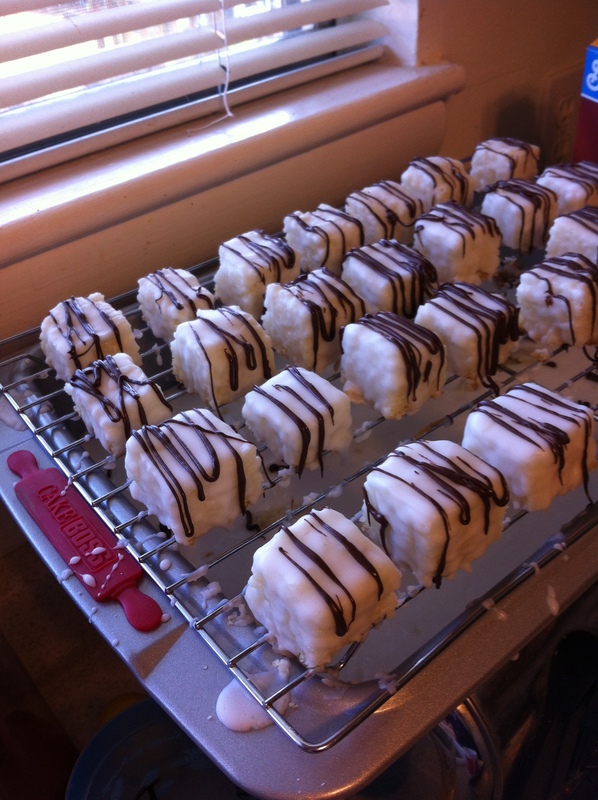 Last weekend I made petit fours for the first time and they turned out pretty good. (I’ll post my recipe when it’s perfected) But I had a lot of cake scraps and glaze left over so I decided to make cake pops! They turned out splendidly but there were a few struggles along the way. Usually I use a dense cake for my cake pops because it stays together more easily with less frosting but the petit fours were really light and I was using the glaze to stick it together instead of icing. It was a bit harder and I was worried that it was going to taste a little grainy but I just went with it. They still weren’t holding up very well so I put them in the freezer for a bit before I dipped them in the chocolate… bad idea. You cant dip something freezing cold in melting chocolate that hardens when it gets cold. It hardens and gets all clumpy before you can pull it out! So I just waited a little while for them to warm up a little bit. All was good after that and I decorated them and wrapped them up and gave them to my family and friends and they all loved them! Last weekend, I volunteered with NOCCA at the Home and Garden Show. We set up a booth and we sold the jellies, jams, pickled vegetables, and other canned things that we made in class. It was a really great experience that definitely brought me out of my shell a little because we had to talk to people and tell them about our products and our program at NOCCA. It was fun but the best part was when we got to walk around and see the other booths. Most of the food booths had samples so we got to try a lot of great food. They had a few pepper jelly booths so it was fun to try them all and decide which was best. (I think our NOCCA pepper jelly was the best!) They also had a fudge booth, a snowball booth, a beef jerky booth, and a Vitamix booth. At the Vitamix booth they made a really good chocolate smoothie. It had avocado, spinach, and kale in it but all you tasted was the chocolate! They also had a lot of cool booths that weren’t selling food. They had a Miracle Whisk booth, an aroma therapy booth, and a bunch of different booths that sold kitchen, home, and garden appliances. I wanted to buy all the things! Everything was really cool but I have to say, my favorite thing was the Oil and Vinegar booth. Oil and Vinegar is a store that sells… oil… and vinegar. But they also sell spices and honey and their oil and vinegar is A-MA-ZING! They had little pieces of bread that you could dip in the oils and vinegars to try them and they were so good! You know you’re a culinary kid when you start fangirling over oil and vinegar. My favorite was the strawberry vinegar. It’s sweet but not overpoweringly sweet and you can really taste the strawberry flavor. So I bought it! It was pretty expensive but it was worth it! When I got home I made a strawberry and roasted kale salad with a strawberry vinaigrette that I made with my strawberry vinegar! I mixed the strawberry vinegar and some olive oil with some honey to emulsify it. I cut up some tiny strawberry pieces in there and I added a pinch of pepper to bring out the strawberry flavor. I’m really picky about my salad dressings but it turned out wonderfully if I do say so myself! You really know you’re a culinary kid if you spend your Saturday night making vinaigrette and kale salad with your new vinegar and then you hide your vinegar in your closet so nobody steals the deliciousness… If I ever went to the actual Oil and Vinegar store, I’m pretty sure I would spend all my money there… What can I say? A girl’s gotta have her oil and vinegar. 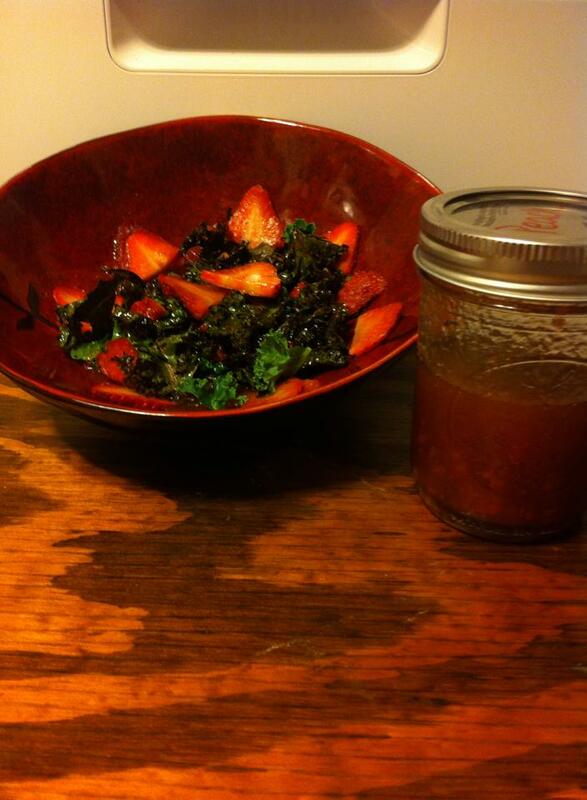 Strawberry and roasted kale salad with strawberry vinaigrette!